Five years after releasing the love of his life to another man, the Duke of Surrey struggles with deep remorse about his past decisions. Chained in a loveless marriage of convenience and strangled by duty, he wallows in regret and drink. Everything in his life changes, when on holiday in Paris, he meets a young boy and his former rival. Suddenly, he finds himself thrown into a whirlwind of deceit and lies as he searches for the meaning of truth and love. 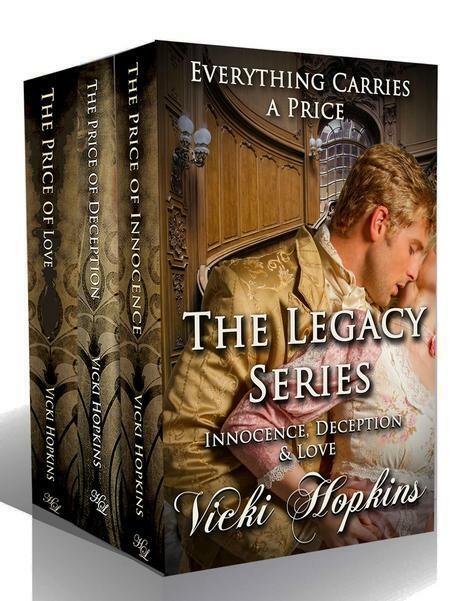 Just like innocence, deception carries a price. Book Two of the Legacy Series weaves a tangled web of deceit and dire consequences, which in the end rearranges everyone's life on a path of either good or evil. At the age of eighteen, Angelique Jolene von Lamberg felt secure in life. After all, her stepfather was an Austrian count, and she inherited his wealth and the title of komtesse. But when a letter arrives claiming she was kidnapped as a baby, suddenly everything changes. Unable to dismiss the accusations, she embarks on a journey to London and Paris to seek out the truth. When she discovers that her life has been played like a pawn in a chess game of deceit, adultery, and vengeance, she decides to take matters into her own hands. Will she continue to be the victim of the price of love, or will she become the only person able to heal a broken family from the pain of the past? Philippe studied both pistols and grabbed the gun on the right. Robert reached over and retrieved the gun on the left. Pelletier snapped shut the lid of the case and shoved it under his arm. Robert’s heart pounded in his ears as he waited for the instructions to stand back-to-back with Philippe Moreau and then pace off, turn, and shoot. For a quick moment, he thought himself quite insane for agreeing to accept the challenge. He had put his life on the line to win his cherished Suzette and the son he loved. The stakes were high. In the next few minutes, he could very well be dead. He held the pistol in his right hand and looked at the maker’s engraved name on the stock, feeling the weight, and gauging its handling. Made by a French gunnery, it felt somewhat different than the English pistols he had been accustomed to holding. He prayed the use of a foreign weapon would not hamper the accuracy of his aim, even though he was a first-rate shot. Pelletier announced the conditions to them both in a gruff, loud voice. Robert knew then his nemesis intended to shoot to kill. His gut turned into a hard knot, as the moments slipped precariously toward battle. Robert nodded affirmatively. Philippe called out a confident “yes” in response. Quickly, Robert glanced over at Giles who stood on the sidelines watching. The man looked pale as the moon, and Robert lifted his lips in a forced smile. He gave him a quick wink for an ounce of reassurance that all would be well. Robert faced his countdown to eternity. He focused upon Suzette and his beautiful son, who looked so much like him. In a few more seconds, it would be over. One way or the other. Robert turned on his heel, lifted the gun to aim, and heard Philippe’s pistol discharge. He pulled the trigger almost instantaneously in return, and waited for the bullet from Philippe’s pistol to lodge in his heart.